This past weekend, I had the honor and privilege of organizing and leading a "Day of Service" community service project, benefiting a deserving Texas Veteran family, The Babins. This community outreach program is something that I have a passion for because it directly impacts my fellow Texas Veterans. The project was organized in partnership with the Association of the United States Army, the Wounded Warrior Project, TexVet, and my company, Security America Mortgage. Our goals were simple, provide basic home maintenance services to the Babin family and show them that even though their son's time serving in the military has come to an end, the Veteran community at large still supports them and their sacrifice to America. After the events of September 11, 2001, Corporal Alan “Doc” Babin, Jr., enlisted in the Army at the age of 22. He wanted to do something where he could help people and insisted on becoming a medic with the elite 82nd Airborne Division. Alan was constantly a body-in-motion, surrounded by friends and brightening peoples lives with his amazing smile. On March 31, 2003, the 82nd was engaged in heavy gunfire on a bridge over the Euphrates River when a call for a “Medic!” rang out. Alan ran out from a covered position to rush to render aide to his fellow soldier when he was shot through the abdomen. He remained on the hood of a gun-truck for 3 hours before being safely evacuated from the battlefield. His heroic actions inspired his Unit and, for his bravery, he was awarded the Bronze Star with “V” for Valor and the Purple Heart. Alan has survived over 70 surgeries, a stroke, meningitis and a long, complicated medical journey. Doctors expected him to live out his life in a nursing home - but God (and his mom) had a different plan. After spending over 2 years in hospitals, he has since then been clawing his way back to health and inspiring everyone who meets him. His determination and courage during rehab are legendary and he remains positive day-in and out. Alan loves participating in adaptive sports - taking up to 3 ski trips a year since 2006 and this summer made two river rafting trips in Colorado. With his mother, Rosie, as his full-time caregiver, advocate and biggest fan, Alan has re-learned to breathe, talk, eat, move his limbs and to find a “new normal.” He continues to help others “off the battlefield” by sharing his journey, making a difference in the current health-care systems and to be an agent for positive change. 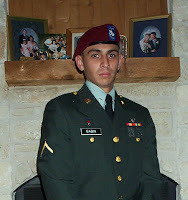 Alan resides with his parents in Round Rock, Texas, and continues to enjoy “LIVING LARGE” with the encouragement of his Sister (Christy) his Dad (Al Sr.), his Mom (Rosie) and the support of many, many Patriots. His father, Al Sr., a Commander for Round Rock Police Department, shares full time caretaker duties with Rosie. And that comes with some challenges. "Home ownership is a 24/7 deal anyways," said Alan Babin, Sr. "So taking care of Alan and trying to get him to all of these different events that we try to keep him involved in, sometimes you just don't have time to get to the things that you need to fix around the house." More "Day of Service" projects are coming soon to a Texas town near you. It is my eternal goal as long as I walk this earth to help my fellow Veterans. Count on that.